Chapters 21 & 22 Star Chart: New Jerusalem (the Zodiac) comes "down from God out of heaven, prepared as a bride adorned for her husband" (Gen. 2:18-24) (Virgo rotating down to the horizon) (21:2) New Jerusalem is a conical or polygonal PYRAMID, not a CUBE, since our Lord is "chief corner stone" (Eph. 2:20-22) at the top. It is called the "TABERNACLE of God" (21:3). "God shall WIPE AWAY all tears from their eyes" means that glistening star tear drops suddenly SHIFT positions instead of streaming down from their eyes as they rotate; and there shall be no more DEATH (cp. Gen. 3:19) (not rotating down UNDER the HORIZON buried in the earth; all humans have either been resurrected or burned up by this time), neither sorrow, nor CRYING (no star teardrops ROTATING), nor pain (cp. Gen. 3:17-19): for the former things are passed away (earth stops rotating?). This indicates how the pole will shift, so that Aries will be where Cepheus is now. Ancient Babylon had a multi-colored, seven-tiered astrological ziggurat PYRAMID where Bel's wife (Virgo) dwelt in the throne room (Herodotus 1:98,178,181). The earth will have 12 moons in the future and no matter which lunar phase exists in any particular moon, there will be eleven that are open ("gates ... not ... shut") "for there shall be no night there" (white zodiac) (21:25) (see Isa. 60:11-20). Babylon's four ancient walls were 120 stadia long each (Her. 1:178). In the midst of Babylon was a PYRAMIDAL tower one furlong square rising tier above tier to the temple at the top which contained only the throne of Bel and the bride of Bel (Her. 1:181). Each tier was a different color dedicated to a different planet. Ecbatana was built on the scheme of the planets also, with seven concentric tiers colored white, black, purple, blue, red, silver, and gold to correspond to the Moon, Sun, Mercury, Venus, Saturn, Jupiter and Mars (Her. 1:98). New Jerusalem is 100 times as great -- equal dimensions of 12,000 stadia (1500 miles) in length, width and height (21:16). "I will give to him that is athirst of the water fountain of life freely" via red radius line straws (21:6), so there are twelve lunar CUPS. The "lake which burneth with FIRE" (21:8) is an eclipse opposite the Lamb. The "twelve GATES were twelve (lunar) PEARLS" (21:12, 21) that wax and wane as they open and close. The red radius lines represent those who "enter through the gates of the city" (22:14) and "they shall bring the glory and honor of the nations into it" (21:26). "The lamb is the (FULL MOON) light of it" (21:23), so "they need no [red radius line] candle" (22:5) -- but have twelve anyway. Also "twelve kinds of (lunar) FRUITS " (22:2) and "her (Virgo) light was like a most precious jasper STONE (amber fire orange cp. Rev. 4:3 & Ez. 1:27) in the form of a gold wedding RING or gold CROWN -- solar corona -- laid at her feet and lunar wedding veil on her head. Virgo's stone is the diamond of Naphtali (Sun in Virgo) (21:11). "And he shewed me a pure river of water of life, clear as crystal (Milky Way), proceeding out of the throne of God (Cepheus) and of the Lamb (Aries) (cp. Gen. 11:9 where Babel had the Euphrates flowing through it.) (22:1). In the midst of its (gold Milky Way-- 21:21) STREET, and on either side of the (green Milky Way) RIVER, was there the TREE OF LIFE (22:2). The red radius lines are the branches extending out from Ursa Minor. The Tree of Life is not the two olive trees of Israel & Judah -- Zech. 4:3; Rev. 11:4 -- represented by the Mulberry Tree -- Canis Minor, and Palm Tree -- Scorpio. This Tree of Life bore twelve types of fruits, and yielded her fruit every month (Full moon is orange or peach; 10/12 full is apple & plum; 8/12 full is olive & grape; 6/12 full is lemon & pecan; 4/12 full is banana & cashew nut; 2/12 full is green bean & jalapino pepper; new moon is purple cherry or brown coconut. The tree leaves (the wings, fish, horns, legs, etc. of starry constellations) were for the nations' healing (olive leaf extract; green tea; stevia; cannabis; digitalis from foxglove) (22:2). How do we get into this city? "Blessed are they that do his commandments, that they may have right to the tree of life (cp. Gen. 3:24) (red radius line branches of tree of life -- a.k.a. 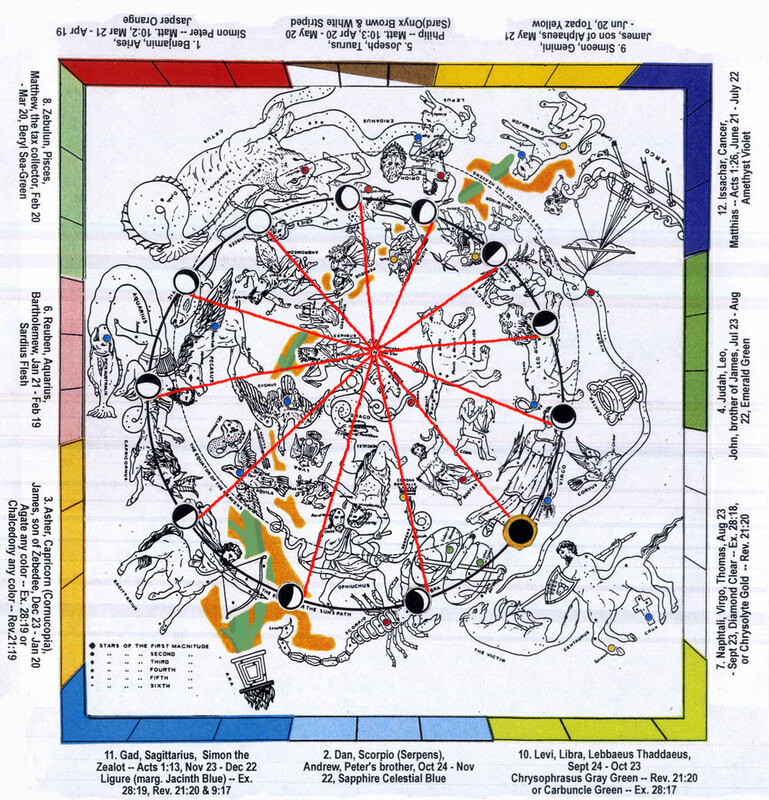 "bright and morning star" -- 22:16), and may (red line radius) enter in through the gates into the city (22:14). For without are dogs ("abominable" --21:8; Canis Major & Minor; Leo alternately a Great Dog; Bootes' alternately Canes Venatici [Hunting Dogs]), and sorcerers (hemp-seed vapors [Milky Way] from Ara -- Her. 4:73), and whoremongers (Ophiuchus & Hercules kissing, etc. ), and murderers (Centaur, etc. ), and idolaters (When the sun is in Taurus, a golden calf -- Ex. 32:8, etcetera), and whosoever loves to make a lie (unjust balance of Libra) (22:15). "I saw a new heaven and earth: for the first heaven and earth were passed away (pole shift? ; 2 Pet. 3:10-13; new gov't. -- Isa. 66:22-23; cp Gen.1:1); and there was no more sea (cp. Gen. 1:10) (no more humans since "sea" means "peoples" -- Isa. 17:12-13; Rev.17:15 -- and they have all either been resurrected or destroyed) (21:1). After the Millenium, the "heavens shall pass away with a great noise, and the elements shall melt with fervent heat; the earth also, and the works that are in it, shall be burned up" (2 Pet. 3:10). Then "we ... look for new heavens and a new earth, wherein dwelleth righteousness" (2 Pet. 3:13). "New heaven" figuratively means "new government." "New earth" figuratively means "new society" (cp. Isa. 65:17; 66:22-24). But not any more. Ezekiel 37:27 says, "My tabernacle also shall be with them (Israel), yea, I will be their God, and they (Israel) shall be my people." Verse 4 restates Isaiah 51:11. And I John saw the holy city, new Jerusalem (entire Zodiac), coming down from God out of heaven, prepared as a bride adorned for her husband (Gen. 2:18-24) (Virgo rotating down to the horizon) (21:2). And I heard a great voice out of heaven saying, Behold, the tabernacle of God is with men, and he will dwell with them, and they shall be his people, and God himself shall be with them, and be their God (Isa. 51:11; Ez. 37:27) (21:3). God shall wipe away all tears from their eyes (glistening star tear drops suddenly shift positions instead of streaming down from their eyes as they rotate); and there shall be no more death (cp. Gen. 3:19) (not rotating down under the horizon buried in the earth; all humans have either been resurrected or burned up by this time), neither sorrow, nor crying (no star teardrops rotating), nor pain (cp. Gen. 3:17-19): for the former things are passed away (earth stops rotating?) (21:4). He that sat on the throne (Cepheus) said, Behold, I make all things new. And he said to me, Write: for these words are true and faithful (21:5). It is done. I am Alpha and Omega, beginning and end. I will give to him that is athirst of the water fountain of life freely (Oval full moon portrays the opened bucket of Aquarius that fills everyone's lunar crescent cup with water. All are at different stages of drinking. Capricorn, Sagittarius & Cancer have the cup to their lips while Scorpio & Gemini have the cup in hand.) (21:6). He that overcomes shall inherit all things; and I will be his God, and he shall be my son (21:7). But the fearful (Pegasus & Cygnus fleeing, afraid of what their friends might think), and unbelieving (evolutionists and atheists; those constellations that are in the dark), and the abominable (unclean creatures and those who eat them -- Cancer, Scorpio, Lepus, Canus, Lupus, Ursa, Leo, Pegasus, Lyra, Aquila, Corvus, Delphinus, Cetus, Hydra, Serpens, Drago -- Lev. 20:25), and murderers (Inquisition; Jihad; abortionists; Centaur, Sagittarius, Orion, Perseus, Hercules, & Bootes with weapons in hand), and whoremongers (Nuns & priests forbidden to marry; Ophiuchus & Hercules kissing, Castor & Pollux together, Virgo with Hydra), and sorcerers (drug pushers; all constellations breathing hemp-seed vapors [the Milky Way] from Ara -- Her. 4:73), and idolaters (praying to "Mary" and "dead saints"; When the sun is in Taurus, a golden calf -- Ex. 32:8; over Orion, a sun pinata; under Auriga, Thor's chariot wheel -- 2 Ki.23:11 (Santa's sleigh); on the Mulberry Tree (Canis Minor), an X-mas ornament -- Jer. 10:4; in Cancer a host in a monstrance with Hydra as the stem; in Leo a carved orange Jack-O-Lantern pumpkin with a black cat; by Crater, a round wafer host & communion cup; at Virgo, Madonna with child ("queen of heaven" -- Jer. 44:19); in addition, Isis & Horus of Coma; Northern Cross; Southern Cross), and all liars (Jesuits; an unjust weight in Libra scales of justice -- either sun or moon), shall have their part in the lake which burneth with fire and brimstone (constellations rotating down into sunset): which is the second death (21:8). "Whosoever shall deny me before men, him will I also deny before my Father which is in heaven" (Matt. 10:33). And there came to me one of the seven angels (seven "wandering stars" or planets -- Moon, Sun, Jupiter, Venus, Mars, Saturn and Mercury) which had the seven vials full of the seven last plagues (Crater), and talked with me, saying, Come here, I will shew thee the bride, the Lamb's wife (Virgo, Aries' wife) (21:9). And he carried me away in the spirit to a great, high mountain (Milky Way hump that Pollux (John) stands on; Kingdom of Israel -- Dan. 2:44-45; Isa. 2:2-3;Heb. 12:22-24), and shewed me that great city, the holy Jerusalem (entire Zodiac), descending out of heaven from God (Zodiac rotating toward the horizon) (21:10), Having the glory of God: and her light was like a most precious jasper stone (amber fire orange -- cp. Rev. 4:3 & Ezek. 1:27 in the form of a gold wedding ring or gold crown) (solar corona eclipse laid at her feet and lunar wedding veil on her head) clear as crystal (Virgo's stone is the diamond of Naphtali) (Sun in Virgo) (21:11); And had a wall great and high, and had twelve gates, and at the gates twelve angels (12 Zodiac signs), and names written thereon, which are the names of the twelve tribes ... of Israel" (21:12). But which tribe is linked with which Zodiac sign? Reuben -- Aquarius (Gen. 49:4). Simeon -- Gemini (Gen. 49:5) but not Levi, since Jacob said he would "divide" (49:7) the two brothers in Israel which means two constellations and not juxtapositioned. One is next to Taurus and the other opposite Taurus since they "hamstring oxen" (49:6) as Taurus falls below the horizon. Levi -- Libra since he collected taxes or tithes. Judah -- Leo (Gen. 49:9). Zebulun -- Pisces since "of the sea" (Gen. 49:13; Deut. 33:18). Issachar -- Cancer, a cattlefold for two asses -- Israel & Judah (Gen. 49:14). Dan -- Scorpio (i.e. Serpens) (Gen. 49:17). A snake that bites the horse's heels, places Scorpio next to Sagittarius. Gad -- Sagittarius (Gen. 49:19: Deut. 33:20). The Archer is like a one man cavalry "troop" overcoming the scorpion. The Messiah "shall overcome at last" (Gen. 49:19; Rev. 19:11-16). Asher -- Capricorn (Cornucopia) (Gen. 49:20). Naphtali -- Virgo (Gen. 49:21). A "hind" or "doe" is a female deer, not a buck. Also, to be "full with the blessing of the Lord" can mean pregnant as the Virgin Mary. The name Naphtali means "to struggle or wrestle" as in birth pangs. Finally, the diamond is associated with marriage. Joseph or Ephraim -- Taurus (Deut. 33:17). Dual-colored gem for two brothers (Ephraim & Manasseh). Benjamin -- Aries (Christ) since most of the apostles and early Christians were from this tribe (1 Ki. 11:31-36; Matt. 5:14) as well as Paul (Philip. 3:5). The order and meaning of the names of the sons: "See a son, hear him, join him, praise him, dwell with him. He will reward, at the judgment, in a company of blessed ones, who have wrestled and been added to the son of my right hand." On the east three gates; north three gates; south three gates; and west three gates (21:13). And the wall of the city had twelve foundations, and in them the names of the twelve apostles of the Lamb (Matt. 10:2-4) (21:14). Which apostle is linked to which stone? We will pair off the list in Matthew 10:2-4 with the foundations of Rev. 21:19-20. And he that talked with me (Pollux) had a golden reed to measure the city (Castor with arrow in hand), and the gates (each lunar phase like a hinged gate) thereof, and the wall thereof (21:15). And the city lies foursquare, the length as large as the breadth: and he measured the city with the reed, twelve thousand furlongs. The length, breadth and height of it are equal (12,000 years cubed = eternal life? ; The inch, furlong, mile and earth’s diameter all relate to eachother: the furlong is 7,920 inches and the mile is 63,360 inches, the earth’s diameter is 7,920 miles or 63,360 furlongs. In other words the earth’s diameter is 7,920 miles x 63,360 inches or 63,360 furlongs x 7,920 inches. A furlong is one-eighth of a mile (5,280 feet divided by 8 = 660 feet). Therefore, one side of the "city" is 7,920,000 feet (12,000 furlongs x 660 feet/furlong). The earth itself has a diameter of 7,920 miles. New Jerusalem is therefore a scaled-down model of earth. Also, the city described in Ezekiel 48:16 measures 4,500 cubits square. This "great cubit" is apparently a cubit plus one hand-breadth, or 1.76 feet. (See Ez. 41:8; 40:5; 43:13.). Ezekiel's city, then, is also proportional to earth in that 4,500 cubits is 7,920 feet. It is noteworthy that 12 x 12 x 12 = 1728 which is the number after 1727. The average of 2300 and 1260 lunar years, or 1780 lunar years, was almost exactly equal to 1727 solar years, giving a cycle of even higher accuracy than the 1040 "Daniel Cycle." The 1780 Dawson Cycle has an error of one day in 19,960 years, or between eight and nine minutes a century (1727 tropical years = 630773.2773276 days; 21360 synodic months = 630773.3639520 days). Notice that 2300 lunar years = 2,231.517159 solar years and 1260 lunar years = 1,222.483313 solar years. The average is 1780 lunar years which = 1,727.000236 solar years. This has an inaccuracy of only two hours in 1,727 years.) (21:16). And he measured the wall thereof, 144 cubits, according to the measure of a man, that is, of the angel (21:17). Now 144 cubits is 216 feet because a cubit is 18 inches, the length from finger tip to elbow, the measure of a man. And 216 is related to the moon: The moon is 2160 miles in diameter (radius 1080 miles) and averages 216,000 miles from earth, 108.3 times its diameter. The sun is 864,900 miles in diameter (roughly 108 diameters of earth -- actually 109.1) and 93,465,000 miles away -- 432 times the moon's distance (216 x 2) or roughly 108 solar diameters (216/2) from the surface of the sun to the surface of the earth -- actually 107.5. It also takes the sun 2,160 years to regress one constellation (the earth loses 1/12 of its 360-degree circuit every 2,160 years). Also we arrive at 2,160 years if we add 49 laps around the sun for each of five planets (Mercury, Venus, Mars, Jupiter and Saturn) so that their start and finish points are the same (sidereal cycle). (Mercury 87.969 days + Venus 224.701 days + Mars 686.979 days + Jupiter 4332.554 days + Saturn 10,759.494 days = 16,091.697 days total divided by 365 = 44.086 years x 49 orbits = 2160.255.) What is so special about 216? It is interesting that one solar day is divided into 24 hours which are each 60 minutes and each minute is composed of 60 seconds. 24 x 60 x 60 = 86,400 seconds in a day (216 x 4 walls = 864 feet). Once again this is 216 x 400 = 86,400. Musically speaking, 432 hertz is the natural central C tuning frequency for the human voice, meaning an octave below is a lower C at 216 hertz. Why is the number 216 so special? Because 6 x 6 x 6 = 216. Since 108 is roughly the average distance between the sun and earth in terms of solar diameters, the average distance between the surfaces of the moon and earth in terms of lunar diameters, and the diameter of the sun in terms of earth diameters (actual figures: 107.5, 108.3, and 109.1 respectively), these remarkable coincidences make the moon appear to be same size as the sun as seen from earth (for lunar and solar eclipses to work). Therefore, the "wall" is a scaled-down model of the Ecliptic or lunar-solar path.. The first foundation was jasper (amber fire orange -- cp. Rev. 4:3 & Ezek. 1:27); the second, sapphire (light pale sky blue -- Ex 24:10); the third, a chalcedony (any color of Asher -- Gen. 49:20); the fourth, an emerald (green) (21:19); The fifth, sardonyx (white & brownish-red bands); the sixth, sardius (flesh color); the seventh, chrysolyte ("clear as crystal" -- 21:11); the eighth, beryl (sea green); the ninth, a topaz (yellow); the tenth, a chrysoprasus (gray green); the eleventh, a jacinth (deep blue color of smoke -- Rev. 9:17); the twelfth, an amethyst (purple) (21:20). But which stone goes with which tribe? Birth order is "Reuben ... Simeon ... Levi ... Judah ... Dan ... Naphtali ... Gad ... Asher ... Issachar ... Zebulun ... Joseph ... Benjamin" (Gen. 29:31; 30:6-24; 35:16-18). Stone order "according to their birth" (Ex. 28:9-10) on the breastplate is "sardius (flesh color) ... topaz (yellow) ... carbuncle (green) ... emerald (green) ... sapphire (celestial blue) ... diamond (clear) ...jacinth (blue) ... agate (any color) ... amethyst (violet) ... beryl (sea green) ... onyx (variegated reddish brown/white) ... jasper (orange)" (Ex. 28:17-20) "every one with his name shall they be according to the twelve tribes" (Ex. 28:21). Therefore, combining both lists we get: Sardius (flesh color) -- Reuben (reminder of his sin with Bilhah -- Gen. 35:22), Topaz (yellow) -- Simeon, Carbuncle (green) -- Levi, Emerald (green) -- Judah, Sapphire (celestial blue) -- Dan, Diamond (clear) -- Naphtali, Ligure (jacinth blue) -- Gad, Agate (any color) -- Asher, Amethyst (violet) -- Issachar, Beryl (sea green) -- Zebulun, Onyx (variegated reddish brown/white) -- Joseph (The High Priest's Ephod contained two onyx stones, one on each shoulder -- for Ephraim and Manasseh [Gen.49:24]), and Jasper (orange) -- Benjamin (see Isa. 54:11-12) (see Rev. 4:3). "Thou shalt call thy walls Salvation, and thy gates Praise" (Isa. 60:18). The twelve gates were twelve pearls: every ... gate ... of one pearl (a different moon phase in each constellation representing one month; This is the "white stone" [Rev. 2:17] which amounts to the pearly gates to the city; this is the "pearl of great price" -- Matt. 13:46). Entrance to the city requires forsaking all to buy it. The city street was pure gold (Milky Way), as it were transparent glass (21:21). I saw no temple therein: for the Lord God Almighty (Cepheus) and the Lamb (Aries) are its temple (21:22). The city had no need of the sun or moon to shine in it: for the glory of God did lighten it, and the Lamb is the light thereof (cp. Gen. 1:16) (New Jerusalem is a PYRAMID, not a CUBE, since the Messiah is "chief corner stone" (Eph. 2:20-22). This also shows us how the pole will shift, so that Aries will be where Cepheus is now) (Ancient Babylon had a multi-colored, seven-tiered astrological ziggurat pyramid where Bel's wife dwelt in the throne room --Her. 1:98,178,181) (21:23). The saved nations shall walk in its light: and the earth's kings bring their glory and honour into it (21:24). And its gates shall not be shut at all by day (The earth will have 12 moons in the future and no matter what lunar phase exists in any particular moon, there will be seven that are at least half open): for there shall be no night there (white zodiac) (21:25) (see Isa. 60:11-20).... And there shall not enter into it any thing that defiles, neither whatsoever works abomination, or makes a lie: but they which are written in the Lamb's book of life (21:27)." Why is the number TWELVE repeated so often? Because TWELVE represents perfect government. For example, the sun which "rules" the day, and the moon and stars which rule the night, pass through TWELVE Zodiac signs. From Seth to Noah were TWELVE patriarchs. From Shem to Jacob were TWELVE. There were TWELVE sons of Jacob and TWELVE tribes of Israel. There were TWELVE judges or deliverers. TWELVE apostles. Our Lord said there were TWELVE legions of angels (Matt. 26:53)." Don't "cast your pearls (or pearly gates) before swine" (Matt. 7:6). They are not allowed to enter. Jesus will "prepare a place" for us (John 14:2) -- "a city which hath foundations, whose builder ... is God" (Heb. 11:10) Christians are "living stones" (1 Pet. 2:5) or "gold, silver, and precious stones" (1 Cor. 3:12). Apparently this is a September 16th wedding. "And he shewed me a pure river of water of life, clear as crystal (Milky Way), proceeding out of the throne of God (Cepheus) and of the Lamb (Aries) (cp. Gen. 11:9 where Babel had Euphrates running through it.) (22:1). In the midst of its (gold Milky Way-- 21:21) street, and on either side of the (green Milky Way) river, was there the tree of life (The two olive trees of Israel & Judah -- Zech. 4:3; Rev. 11:4 -- represented by the Mulberry Tree -- Canis Minor, and Palm Tree -- Scorpio, encompassing the entire Zodiac with green Milky Way trunks), which bore twelve types of fruits, and yielded her fruit every month (Full moon is orange or peach; 10/12 full is apple & plum; 8/12 full is olive & grape; 6/12 full is lemon & pecan; 4/12 full is banana & cashew nut; 2/12 full is green bean & jalapino pepper; new moon is purple cherry or brown coconut. The tree leaves (the wings, fish, horns, legs, etc. of starry constellations) were for the nations' healing (olive leaf extract; green tea; stevia; cannabis; digitalis from foxglove) (22:2). And there shall be no more curse (cp. Gen. 3:14-18): but the throne of God (Cepheus) and of the Lamb (Aries) shall be in it; his servants shall serve him (22:3): They shall see his face; his name shall be in their foreheads (real phylacteries with name Shaddai; Ras al Hagus; Ras al Gethi; etcetera) (22:4). There shall be no night there; and they need no candle, neither light of the sun; for the Lord God giveth them light: and they shall reign for ever and ever (cp. Gen. 1:5) (22:5). He said unto me, These sayings are faithful and true: the Lord God ... sent his angel to shew his servants things which must shortly be done (22:6). Behold, I come quickly: blessed is he that keeps the sayings of this book's prophecy (22:7). When I John saw and heard these things, I fell down to worship before the angel's feet which shewed me these things (22:8). Then said he to me, See thou do it not: for I am thy fellowservant, and of thy brethren the prophets, and of them which keep this book's sayings: worship God (22:9). And he said to me, Seal not the sayings of this book's prophecy: for the time is at hand (22:10). He that is unjust, let him be unjust still: he which is filthy, let him be filthy still: he that is righteous, let him be righteous still: he that is holy, let him be holy still (22:11). Behold, I come quickly; and my reward is with me, to give every man according as his work shall be (22:12). I am Alpha and Omega, beginning and end, first and last (22:13). Blessed are they that do his commandments, that they may have right to the tree of life (cp. Gen. 3:24) (Scorpio -- Palm Tree? ), and may enter in through the gates into the city (22:14). For without (pole shift) are dogs ("abominable" --21:8; Canis Major & Minor; Leo alternately a Great Dog; Bootes' alternately Canes Venatici [Hunting Dogs]), and sorcerers (hemp-seed vapors [Milky Way] from Ara -- Her. 4:73), and whoremongers (Ophiuchus & Hercules kissing, etc. ), and murderers (Centaur, etc. ), and idolaters (When the sun is in Taurus, a golden calf -- Ex. 32:8, etcetera), and whosoever loves to make a lie (unjust balance of Libra) (22:15) (cp. Gen.; 3:4-7). I Jesus have sent mine angel to testify unto you these things in the churches. I am the root (Hydra) and the offspring of David (Coma), and the bright and morning star (Venus) (22:16).... Let him that is athirst come. Whosoever will, let him take the water of life (Aquarius) freely (22:17)." Isaiah 11:6-10 says, "The wolf (Victim) also shall dwell with the lamb (Aries), and the leopard (Ursa Minor) shall lie down with the kid (Auriga holds two kids & Capricorn is a kid); and the calf (Ursa Major -- seven ploughing oxen -- Rome) and the young lion (Leo) and the fatling together; and a little child (Coma or Gemini) shall lead them. And the cow and the bear (Ursa Major) shall feed; their young ones shall lie down together: and the lion (Leo) shall eat straw like the ox (Taurus). And the sucking child (Coma) shall play on the hole (Zodiac circle) of the asp (Hydra, Drago, Serpens), and the weaned child shall put his hand on the cockatrice' den. They shall not hurt nor destroy in all my holy mountain (Milky Way hump) (Orion playing lacrosse; Leo playing with a ball of yarn; Sagittarius practicing archery; the moon-olive on Scorpio's stinger and the moon-bag over his head; all other constellations with balloons or beach balls): for the earth shall be full of the knowledge of the LORD, as the waters cover the sea. And in that day there shall be a root of Jesse (Hydra), which shall stand for an ensign of the people; to it shall the Gentiles seek: and his rest shall be glorious." "I saw a new heaven and earth: for the first heaven and earth were passed away (2 Pet. 3:10-13; new gov't. -- Isa. 66:22-23; cp Gen.1:1); and there was no more sea (cp. Gen. 1:10) (pole shift? ; no more humans since "sea" means "peoples" -- Isa. 17:12-13; Rev.17:15) (21:1). And I John saw the holy city, new Jerusalem (entire Zodiac), coming down from God out of heaven, prepared as a bride adorned for her husband (Gen. 2:18-24) (Virgo rotating down to the horizon) (21:2). And I heard a great voice out of heaven saying, Behold, the tabernacle of God is with men, and he will dwell with them, and they shall be his people, and God himself shall be with them, and be their God (Isa. 51:11; Ez. 37:27) (21:3). God shall wipe away all tears from their eyes (glistening star tear drops suddenly shift positions instead of streaming down from their eyes as they rotate); and there shall be no more death (cp. Gen. 3:19) (not rotating down under the horizon buried in the earth; all humans have either been resurrected or burned up by this time), neither sorrow, nor crying (no star teardrops rotating), nor pain (cp. Gen. 3:17-19): for the former things are passed away (earth stops rotating?) (21:4). He that sat on the throne (Cepheus) said, Behold, I make all things new. And he said to me, Write: for these words are true and faithful (21:5). It is done. I am Alpha and Omega, beginning and end. I will give to him that is athirst of the water fountain of life freely (Oval full moon portrays the opened bucket of Aquarius that fills everyone's lunar crescent cup with water. All are at different stages of drinking. Capricorn, Sagittarius & Cancer have the cup to their lips while Scorpio & Gemini have the cup in hand.) (21:6). He that overcomes shall inherit all things; and I will be his God, and he shall be my son (21:7). But the fearful (Pegasus & Cygnus fleeing), and unbelieving (evolutionists; those constellations that are in the dark), and the abominable (unclean creatures and those who eat them -- Cancer, Scorpio, Lepus, Canus, Lupus, Ursa, Leo, Pegasus, Lyra, Aquila, Corvus, Delphinus, Cetus, Hydra, Serpens, Drago -- Lev. 20:25), and murderers (Inquisition; Jihad; abortionists; Centaur, Sagittarius, Orion, Perseus, Hercules, & Bootes with weapons in hand), and whoremongers (Nuns & priests forbidden to marry; Ophiuchus & Hercules kissing, Castor & Pollux together, Virgo with Hydra), and sorcerers (drug pushers; all constellations breathing hemp-seed vapors [the Milky Way] from Ara -- Her. 4:73), and idolaters (praying to "Mary" and "dead saints"; When the sun is in Taurus, a golden calf -- Ex. 32:8; over Orion, a sun pinata; under Auriga, Thor's chariot wheel -- 2 Ki.23:11 (Santa's sleigh); on the Mulberry Tree (Canis Minor), an X-mas ornament -- Jer. 10:4; in Cancer a host in a monstrance with Hydra as the stem; in Leo a carved orange Jack-O-Lantern pumpkin with a black cat; by Crater, a round wafer host & communion cup; at Virgo, Madonna with child ("queen of heaven" -- Jer. 44:19); in addition, Isis & Horus of Coma; Northern Cross; Southern Cross), and all liars (Jesuits; an unjust weight in Libra scales of justice -- either sun or moon), shall have their part in the lake which burneth with fire and brimstone (constellations rotating down into sunset): which is the second death (21:8). What is the "HIGH MOUNTAIN"? Astronomically, Cancer is the Sheepfold or New Jerusalem. Historically, the "great and high mountain" is the kingdom of Israel since Daniel 2:35,44-45 describe Israel as a "stone" growing into "a great mountain." Yes, "In the last days the mountain of the Lord's house shall be established in the top of the (Gentile) mountains" (Isa. 2:2-3). Hebrews 12:22-24 says "MOUNT Zion" is "the city of the Living God" and "the heavenly Jerusalem." "New Jerusalem" is a PYRAMID rather than a cube because in addition to having a "foundation of the apostles and prophets" it has Jesus Christ as the "chief corner stone" (Eph. 2:20-22). The only type of building which has one chief cornerstone is a PYRAMID. Babylon's four ancient walls were 120 stadia long each (Herod. 1:178). In the midst of Babylon was a PYRAMIDAL tower one furlong square rising tier above tier to the temple at the top which contained only the throne of Bel and the bride of Bel (Her.1:181). Each tier was a different color dedicated to a different planet. Ecbatana was built on the scheme of the planets also, with seven concentric tiers colored white, black, purple, blue, red, silver and gold to correspond to the Moon, Sun, Mercury, Venus, Saturn, Jupiter and Mars (Her. 1:98). The Euphrates flowed through the midst of it. New Jerusalem is 100 times as great -- equal dimensions of 12,000 stadia (1500 miles) in length, width and height. If set down in Europe, its four corners would cover Gibraltar, Greece, St. Petersburg and the Hebrides and it would soar 100 times higher than the Himalayas -- unless the 12,000 stadia are the circumference in which case we divide by four. The throne of God and the Lamb is at the summit so the river of life can flow down from it. The Bride of the Lamb lives there. Jesus said he would "prepare a place" for us (John 14:2) -- "a city which hath foundations, whose builder and maker is God" (Heb. 11:10). Christians are "living stones" (1 Pet. 2:5). Worthy saints are compared to "gold, silver, and precious stones" (1 Cor. 3:12). And there came to me one of the seven angels (seven "wandering stars" or planets -- Mercury, Venus, Mars, Jupiter, Saturn, Sun & Moon) which had the seven vials full of the seven last plagues (Crater), and talked with me, saying, Come here, I will shew thee the bride, the Lamb's wife (Virgo, Aries' wife) (21:9). And he carried me away in the spirit to a great, high mountain (Milky Way hump that Pollux (John) stands on; Kingdom of Israel -- Dan. 2:44-45; Isa. 2:2-3;Heb. 12:22-24), and shewed me that great city, the holy Jerusalem (entire Zodiac), descending out of heaven from God (Zodiac rotating toward the horizon) (21:10), Having the glory of God: and her light was like a most precious jasper stone (amber fire orange -- cp. Rev. 4:3 & Ezek. 1:27 in the form of a gold wedding ring or gold crown) (solar corona eclipse laid at her feet and lunar wedding veil on her head) clear as crystal (Virgo's stone is the diamond of Naphtali) (Sun in Virgo) (21:11); And had a wall great and high, and had twelve gates, and at the gates twelve angels (12 Zodiac signs), and names written thereon, which are the names of the twelve tribes ... of Israel (21:12). But which tribe is linked with which Zodiac sign? Reuben -- Aquarius (Gen. 49:4). Simeon -- Gemini (Gen. 49:5) but not Levi, since Jacob said he would "divide" (49:7) the two brothers in Israel which means two constellations and not juxtapositioned. One is next to Taurus and the other opposite Taurus since they "hamstring oxen" (49:6) as Taurus falls below the horizon. Levi -- Libra since he collected taxes or tithes. Judah -- Leo (Gen. 49:9). Zebulun -- Pisces since "of the sea" (Gen. 49:13; Deut. 33:18). Issachar -- Cancer, a cattlefold for two asses -- Israel & Judah (Gen. 49:14). Dan -- Scorpio (i.e. Serpens) (Gen. 49:17). A snake that bites the horse's heels, places Scorpio next to Sagittarius. Gad -- Sagittarius (Gen. 49:19: Deut. 33:20). The Archer is like a one man cavalry "troop" overcoming the scorpion. The Messiah "shall overcome at last" (Gen. 49:19; Rev. 19:11-16). Asher -- Capricorn (Cornucopia) (Gen. 49:20). Naphtali -- Virgo (Gen. 49:21). A "hind" or "doe" is a female deer, not a buck. Also, to be "full with the blessing of the Lord" can mean pregnant as the Virgin Mary. The name Naphtali means "to struggle or wrestle" as in birth pangs. Finally, the diamond is associated with marriage. Joseph or Ephraim -- Taurus (Deut. 33:17). Dual-colored gem for two brothers (Ephraim & Manasseh). Benjamin -- Aries (Christ) since most of the apostles and early Christians were from this tribe (1 Ki. 11:31-36; Matt. 5:14) as well as Paul (Philip. 3:5). The order and meaning of the names of the sons: "See a son, hear him, join him, praise him, dwell with him. He will reward, at the judgment, in a company of blessed ones, who have wrestled and been added to the son of my right hand." On the east three gates; north three gates; south three gates; and west three gates (21:13). And the wall of the city had twelve foundations, and in them the names of the twelve apostles of the Lamb (Matt. 10:2-4) (21:14). Why "PRECIOUS STONES"? Christ's promise in Matthew 6:33 was that if Israel were to seek first God's kingdom and his righteousness, all these material things would be added. God promised divorced Israel, "I will lay thy stones with fair colors, and lay thy foundations with sapphires. And I will make thy windows of agates, and thy gates of carbuncles, and all thy borders of pleasant stones. And all thy children shall be taught of the Eternal ... In righteousness shalt thou be established ... No weapon that is formed against thee shall prosper" (Isa.54:11-17). The street of pure gold refers back to the floor of the Holy of Holies in Solomon's Temple as being overlaid with gold (1 Ki. 6:30). Which apostle is linked to which stone? We will pair off the list in Matthew 10:2-4 with the foundations of Rev. 21:19-20. And he that talked with me (Pollux) had a golden reed to measure the city (Castor with arrow in hand), and the gates (each lunar phase like a hinged gate) thereof, and the wall thereof (21:15). And the city lies foursquare, the length as large as the breadth: and he measured the city with the reed, twelve thousand furlongs. The length, breadth and height of it are equal (12,000 years cubed = eternal life? ; The inch, furlong, mile and earth’s diameter all relate to eachother: the furlong is 7,920 inches and the mile is 63,360 inches, the earth’s diameter is 7,920 miles or 63,360 furlongs. In other words the earth’s diameter is 7,920 miles x 63,360 inches or 63,360 furlongs x 7,920 inches. A furlong is one-eighth of a mile (5,280 feet divided by 8 = 660 feet). Therefore, one side of the "city" is 7,920,000 feet (12,000 furlongs x 660 feet/furlong). The earth itself has a diameter of 7,920 miles. New Jerusalem is therefore a scaled-down model of earth. Also, the city described in Ezekiel 48:16 measures 4,500 cubits square. This "great cubit" is apparently a cubit plus one hand-breadth, or 1.76 feet. (See Ez. 41:8; 40:5; 43:13.). Ezekiel's city, then, is also proportional to earth in that 4,500 cubits is 7,920 feet. It is noteworthy that 12 x 12 x 12 = 1728 which is the number after 1727. The average of 2300 and 1260 lunar years, or 1780 lunar years, was almost exactly equal to 1727 solar years, giving a cycle of even higher accuracy than the 1040 "Daniel Cycle." The 1780 Dawson Cycle has an error of one day in 19,960 years, or between eight and nine minutes a century (1727 tropical years = 630773.2773276 days; 21360 synodic months = 630773.3639520 days). Notice that 2300 lunar years = 2,231.517159 solar years and 1260 lunar years = 1,222.483313 solar years. The average is 1780 lunar years which = 1,727.000236 solar years. This has an inaccuracy of only two hours in 1,727 years.) (21:16). And he measured the wall thereof, 144 cubits, according to the measure of a man, that is, of the angel (21:17). Now 144 cubits is 216 feet because a cubit is 18 inches, the length from finger tip to elbow, the measure of a man. And 216 is related to the moon: The moon is 2160 miles in diameter (radius 1080 miles) and averages 216,000 miles from earth, 108.3 times its diameter. The sun is 864,900 miles in diameter (roughly 108 diameters of earth -- actually 109.1) and 93,465,000 miles away -- 432 times the moon's distance (216 x 2) or roughly 108 solar diameters (216/2) from the surface of the sun to the surface of the earth -- actually 107.5. It also takes the sun 2,160 years to regress one constellation (the earth loses 1/12 of its 360-degree circuit every 2,160 years). Also we arrive at 2,160 years if we add 49 laps around the sun for each of five planets (Mercury, Venus, Mars, Jupiter and Saturn) so that their start and finish points are the same (sidereal cycle). (Mercury 87.969 days + Venus 224.701 days + Mars 686.979 days + Jupiter 4332.554 days + Saturn 10,759.494 days = 16,091.697 days total divided by 365 = 44.086 years x 49 orbits = 2160.255.) What is so special about 216? It is interesting that one solar day is divided into 24 hours which are each 60 minutes and each minute is composed of 60 seconds. 24 x 60 x 60 = 86,400 seconds in a day (216 x 4 walls = 864 feet). Once again this is 216 x 400 = 86,400. Musically speaking, 432 hertz is the natural central C tuning frequency for the human voice, meaning an octave below is a lower C at 216 hertz. Why is the number 216 so special? Because 6 x 6 x 6 = 216. Since 108 is roughly the average distance between the sun and earth in terms of solar diameters, the average distance between the surfaces of the moon and earth in terms of lunar diameters, and the diameter of the sun in terms of earth diameters (actual figures: 107.5, 108.3, and 109.1 respectively), these remarkable coincidences make the moon appear to be same size as the sun as seen from earth (for lunar and solar eclipses to work). Therefore, the "wall" is a scaled-down model of the Ecliptic or lunar-solar path. And its wall-building was of jasper (amber fire orange -- cp. Rev. :3 & Ezek. 1:27), and the city was pure gold, like clear glass (21:18). The foundations of the wall of the city were garnished with all manner of precious stones (called stars: Antares is red (Scorpio), Zubeneschamali green (Libra), Zuben al Genubi pale yellow (Libra), Spica blue (Virgo), Denebola bluish white (Leo), Regulus is bluish white (Leo), Alphard red (Hydra), Pollux yellow, Castor white (Gemini), Procyon white (Canis Minor), Wezen yellow (Canis Major), Betelgeuse is red (Orion), Aldebaran orange (Taurus), Menkar red (Cetus), Markab blue (Pegasus), Fomalhaut is bluish white (Pisces Aust. ), Al Tair bluish white (Aquila), Draconis red (Drago), Arcturus orange (Bootes), Vega white (Lyra), Deneb bluish white (Cygnus), Sirius bluish white (Canis Major), Canopus white (Argo), Rigel bluish white (Orion), Capella yellow (Auriga), Toliman yellow (Centaur), Acrux bluish (Crux), and a Coronae Borealis is yellow (Corona Borealis). The first foundation was jasper (amber fire orange -- cp. Rev. 4:3 & Ezek. 1:27); the second, sapphire (light pale sky blue -- Ex 24:10); the third, a chalcedony (any color of Asher -- Gen. 49:20); the fourth, an emerald (green) (21:19); The fifth, sardonyx (white & brownish-red bands); the sixth, sardius (flesh color); the seventh, chrysolyte ("clear as crystal" -- 21:11); the eighth, beryl (sea green); the ninth, a topaz (yellow); the tenth, a chrysoprasus (gray green); the eleventh, a jacinth (deep blue color of smoke -- Rev. 9:17); the twelfth, an amethyst (purple) (21:20). But which stone goes with which tribe? Birth order is "Reuben ... Simeon ... Levi ... Judah ... Dan ... Naphtali ... Gad ... Asher ... Issachar ... Zebulun ... Joseph ... Benjamin" (Gen. 29:31; 30:6-24; 35:16-18). Stone order "according to their birth" (Ex. 28:9-10) on the breastplate is "sardius (flesh color) ... topaz (yellow) ... carbuncle (green) ... emerald (green) ... sapphire (celestial blue) ... diamond (clear) ...jacinth (blue) ... agate (any color) ... amethyst (violet) ... beryl (sea green) ... onyx (variegated reddish brown/white) ... jasper (orange)" (Ex. 28:17-20) "every one with his name shall they be according to the twelve tribes" (Ex. 28:21).Therefore, combining both lists we get: Sardius (flesh color) -- Reuben (reminder of his sin with Bilhah -- Gen. 35:22), Topaz (yellow) -- Simeon, Carbuncle (green) -- Levi, Emerald (green) -- Judah, Sapphire (celestial blue) -- Dan, Diamond (clear) -- Naphtali, Ligure (jacinth blue) -- Gad, Agate (any color) -- Asher, Amethyst (violet) -- Issachar, Beryl (sea green) -- Zebulun, Onyx (variegated reddish brown/white) -- Joseph (The High Priest's Ephod contained two onyx stones, one on each shoulder -- for Ephraim and Manasseh [Gen.49:24]), and Jasper (orange) -- Benjamin (see Isa. 54:11-12) (see Rev. 4:3). The twelve gates were twelve pearls: every ... gate ... of one pearl (a different moon phase in each constellation representing one month; This is the "white stone" [Rev. 2:17] which amounts to the pearly gates to the city; this is the "pearl of great price" -- Matt. 13:46): and the city street was pure gold (Milky Way), as it were transparent glass (21:21). Revelation 21:9-21 should come between verses 3 and 4 of Revelation 20. It is out of place here (see An Attempt to Recover the Original Order of the Text of Revelation 20:4 - 22 by Canon Charles D.D.). The fact that it was one of the seven vial angels (Rev. 21:9; 17:1) which revealed the vision of the "Lamb's wife" to John, shows that this vision is in contrast with that of the rival harlot "Babylon" (Rev. 19:7) and should appear in the same context of the seven vials -- Rev. 15 to Rev. 20:3 -- not after the Millenial and post-Millenial reigns of Christ shown in Rev. 20:4-15 and Rev. 21:1-8. I saw no temple therein: for the Lord God Almighty (Cepheus) and the Lamb (Aries) are its temple (21:22). The city had no need of the sun or moon to shine in it: for the glory of God did lighten it, and the Lamb is the light thereof (cp. Gen. 1:16) (New Jerusalem is a PYRAMID, not a CUBE, since the Messiah is "chief corner stone" (Eph. 2:20-22). This also shows us how the pole will shift, so that Aries will be where Cepheus is now) (Ancient Babylon had a multi-colored, seven-tiered astrological ziggurat pyramid where where Bel's wife dwelt in throne room --Her. 1:98,178,181) (21:23). The "Shekinah Glory" of the Lord filled the tabernacle of Moses in the wilderness (Ex. 40:34-35). This glory also filled the Temple of Solomon (1 Ki. 8:10-11). "The moon shall be confounded, and the sun ashamed, when the Lord of Hosts shall reign in Zion, and in Jerusalem, before his ancients gloriously" (Isa. 24:23). "Thy gates shall be open continually; they shall not be shut day nor night, that men may bring unto thee the forces (wealth) of the Gentiles, and that their kings may be brought.... The sun shall be no more thy light by day; neither for brightness shall the moon give light unto thee: But the Lord shall be unto thee an everlasting light, and thy God thy glory. Thy sun shall no more go down; neither shall thy moon withdraw itself: for the Lord shall be thine everlasting light, and the days of thy mourning shall be ended" (Isa. 60:11,19-20). Now the whole kingdom of Israel (after the Millenium) -- just as the elect church (before the Millenium) -- is "builded together (as an immortal structure) for an habitation of God through the Spirit" (Eph. 2:22). The clause "of them which are saved" is spurious and has no textual authority in verse 24. But this makes little difference in light of Micah 4:2 which says, "Many nations shall come, and say, Come, and let us go up to the mountain of the Eternal, and to the house of the God of Jacob; and he will teach us of his ways, and we will walk in his paths; for the law shall go forth from Zion, and the word of the Lord from Jerusalem." "Lift up thine eyes round about, and behold; all these (Gentiles?) gather themselves together, and come to thee. As I live, saith the Eternal, thou shalt surely clothe thee with them all, as with an ornament, and bind them on thee, as a bride doeth" (Isa. 49:18). Gentiles can become Israelites because "If ye be Christ's, then are ye Abraham's seed" (Gal. 3:29). This is how God will "make a full end of all nations" (Jer. 30:11) except Israel. Otherwise Gentiles "have no hope and are without God in the world" (Eph. 2:12). Why is New Jerusalem composed mainly of JASPER? Rev. 4:3 says GOD is "to look upon like a JASPER." New Jerusalem is "perfect through MY comliness which I had put upon thee, saith the Lord God" (Ez. 16:14). Furthermore, BENJAMIN was given spiritual understanding described as "LIGHT" (1 Ki. 11:13, 32,36). This tribe's stone was JASPER according to birth order and the stones on the breastplate (Ex. 28:15-21). This New Jerusalem is composed mainly of JASPER which emphasizes the fact that Godly wisdom, knowledge and understanding will be the governing and controlling factor throughout the life of this CITY. All the disciples of Jesus were from the tribe of BENJAMIN except Judas Iscariot. This tribe was given to the Kingdom of Judah "that David my servant may have a LIGHT always before me in JERUSALEM" (2 Ki. 11:13,32,36; 15:4; 1 Ki. 8:19; 2 Chr. 21:7). Jesus told his disciples "ye are the LIGHT of the world" and "a CITY that is set on a hill cannot be hid" (Matt. 5:14-16). The apostle Paul said he was of the tribe of BENJAMIN (Philip. 3:5). BENJAMIN'S mission was "say ye, The Lord hath redeemed his servant Jacob" (Isa. 48:20). Therefore it is easy to see why JASPER is the color of New Jerusalem. The gates of the cities in ancient times had to be shut at night to keep out evildoers. In God's kingdom there will be no "darkness" behind which fear or evil can hide. The light of the truth will destroy all darkness of error. Revelation 21:22-27 are taken from Isaiah 60:11,19,20 and demonstrate again that God's servant nation will be Israel until the goal of the creation of an immortal human race is reached. The saved nations shall walk in its light: and the earth's kings bring their glory and honour into it (21:24). And its gates shall not be shut at all by day (full open moon): for there shall be no night there (white zodiac) (21:25) (see Isa. 60:11-20).... And there shall not enter into it any thing that defiles, neither whatsoever works abomination, or makes a lie: but they which are written in the Lamb's book of life (21:27)." Don't "cast your pearls (or pearly gates) before swine" (Matt. 7:6). Jesus will "prepare a place" for us (John 14:2) -- "a city which hath foundations, whose builder ... is God" (Heb. 11:10) Christians are "living stones" (1 Pet. 2:5) or "gold, silver, and precious stones" (1 Cor. 3:12). Apparently this is a September 16th wedding. Notice the contrasting parallels between Genesis and Revelation. These parallels prove that Revelation is the final book of the Bible. Earth created (1:1). Earth passes away (21:1). Sun made visible (1:16). No need of the sun (21:23). Darkness called night (1:5). "No night there" (21:25; 22:5). Waters called seas (1:10). "No more sea" (21:1). Sin enters (3:4-7). End of sin (21:4,8; 22:14-15). Curse pronounced (3:14-18). "No more curse" (22:3). Death entered (3:19). "No more death" (21:4). Tree of life forbidden (3:24). "Right to tree of life" (22:14). Sorrow and suffering enter (3:17-19). "No more sorrow or crying" (21:4). Marriage of first Adam to a physical woman built by God (2:18-24). Marriage of last Adam to a spiritual woman built by God (19:1-9). Nimrod builds Babylon (10:8-9). "Babylon ... is fallen" (18:2 ). The Euphrates River (of Eden) ran through the middle of ancient Babylon. The river of the Water of Life runs through the middle of New Jerusalem (22:1). Ancient Babylon had a multi-colored, 7-tiered, astrological tower in the shape of a pyramid zigguret where the wife of Bel dwelt in a throne room (Her. 1:98,178,181). New Jerusalem will have a multi-colored, 12-tiered, astronomical pyramid where the Lamb's wife will dwell in his throne room (21). Two angels visit Sodom (19). Two witnesses visit Babylon (spiritual Sodom) (11:1-12). Lot comes out of Sodom to escape plagues (19:15-17). Saints "come out of" Babylon to escape plagues (18:4). Etcetera. These changes all become possible when we "put on immortality" (1 Cor. 15:53-54 taken from Isaiah 25:6-9 talking about Israel). Then "O death, where is thy sting" (1 Cor. 15:55 taken from Hosea 13:14 talking about Israel). By means of phylacteries, the Jews put the name Shaddai on their foreheads when they pray. And he shewed me a pure river of water of life, clear as crystal (Milky Way), proceeding out of the throne of God (Cepheus) and of the Lamb (Aries) (cp. Gen. 11:9 where Babel had Euphrates running through it.) (22:1). In the midst of its (gold Milky Way -- 21:21) street, and on either side of the (green Milky Way) river, was there the tree of life (The two olive trees of Israel & Judah -- Zech. 4:3; Rev. 11:4 -- represented by the Mulberry Tree -- Canis Minor, and Palm Tree -- Scorpio, which encompass the entire Zodiac and whose trunks are the green Milky Way), which bore twelve types of fruits, and yielded her fruit every month (Full moon is orange or peach; 10/12 full is apple & plum; : 8/12 full is olive & grape; 6/12 full is lemon & pecan; 4/12 full is banana & cashew nut; 2/12 full is green bean & jalapino pepper; new moon is purple cherry or brown coconut. The tree leaves (the wings, fish, horns, legs, etc. of starry constellations) were for the nations' healing (olive leaf extract; green tea; stevia; cannabis; digitalis from foxglove) (22:2). And there shall be no more curse (cp. Gen. 3:14-18): but the throne of God (Cepheus) and of the Lamb (Aries) shall be in it; his servants shall serve him (22:3): They shall see his face; his name shall be in their foreheads (real phylacteries with name Shaddai; Ras al Hagus; Ras al Gethi; etcetera) (22:4). There shall be no night there; and they need no candle, neither light of the sun; for the Lord God giveth them light: and they shall reign for ever and ever (cp. Gen. 1:5) (22:5). He said unto me, These sayings are faithful and true: the Lord God ... sent his angel to shew his servants things which must shortly be done (22:6). Behold, I come quickly: blessed is he that keeps the sayings of this book's prophecy (22:7). When I John saw and heard these things, I fell down to worship before the angel's feet which shewed me these things (22:8). Then said he to me, See thou do it not: for I am thy fellowservant, and of thy brethren the prophets, and of them which keep this book's sayings: worship God (22:9). And he said to me, Seal not the sayings of this book's prophecy: for the time is at hand (22:10). He that is unjust, let him be unjust still: he which is filthy, let him be filthy still: he that is righteous, let him be righteous still: he that is holy, let him be holy still (22:11). Daniel was told to "Shut up the words, and seal the book, even to the time of the end" (Dan. 12:4). John was told the opposite -- "Seal not." In other words, Explain it since the time of the end is here. But just as Daniel was told that "the wicked shall do wickedly: and none of the wicked shall understand" (Dan. 12:10), so also John is told to let the unjust remain that way. "Give not that which is holy unto the dogs, neither cast your pearls before swine, lest they trample them under their feet, and turn again and rend you" (Matt. 7:6). There comes a time in the life of men and nations when their fate is fixed. Ways become set and habits callously harden. We eventually become what our actions over time and habits make us. Punishment is then the only remedy. Behold, I come quickly; and my reward is with me, to give every man according as his work shall be (22:12). I am Alpha and Omega, beginning and end, first and last (22:13). Blessed are they that do his commandments, that they may have right to the tree of life (cp. Gen. 3:24) (Scorpio -- Palm Tree? ), and may enter in through the gates into the city (22:14). For without (pole shift) are dogs ("abominable" --21:8; Canis Major & Minor; Leo alternately a Great Dog; Bootes' alternately Canes Venatici [Hunting Dogs]), and sorcerers (hemp-seed vapors [Milky Way] from Ara -- Her. 4:73), and whoremongers (Ophiuchus & Hercules kissing, etc. ), and murderers (Centaur, etc. ), and idolaters (When the sun is in Taurus, a golden calf -- Ex. 32:8, etcetera), and whosoever loves to make a lie (unjust balance of Libra) (22:15) (cp. Gen.; 3:4-7). We are saved by grace, but rewarded according to our works. Verse 13 is taken from Isaiah 44:6 which says, "Thus saith the Eternal, the king of Israel, and his Redeemer the Eternal of hosts; I am the first, and I am the last; and beside Me there is no God." (cp. Isaiah 41:4) Some translators claim that the original text of verse 14 reads "Blessed are they who wash their robes ..." similar to Rev. 7:14. But Eternal life requires more than merely accepting Christ as Savior. The very next verse prohibits four of the ten commandments -- murder, lying, idolatry and fornication -- showing that commandment-keeping is required to get into the city. "Dogs" is an Eastern term given for all unclean persons. In fact, the list in Rev. 21:8 has "abominable" while the list in Rev. 22:15 has "dogs" instead showing that the two are interchangeable. The other five terms are the same in both lists. Astronomically, Canis Major (Big Dog) and Canis Minor (Small Dog), as well as the alternate image of Leo as a Great Dog and Bootes' Canes Venatici (Hunting Dogs) are all outside "Cancer" (the Cattlefold) -- New Jerusalem. I Jesus have sent mine angel to testify unto you these things in the churches. I am the root (Hydra) and the offspring of David (Coma), and the bright and morning star (Venus) (22:16).... Let him that is athirst come. Whosoever will, let him take the water of life (Aquarius) freely (22:17)." Jesus has sent his faithful angel ( messenger) John to pass on the details of the whole wonderful vision. Isaiah 11:6-10 says, "The wolf (Victim) also shall dwell with the lamb (Aries), and the leopard (Ursa Minor) shall lie down with the kid (Auriga holds two kids & Capricorn is a kid); and the calf (Ursa Major -- seven ploughing oxen -- Rome)and the young lion (Leo) and the fatling together; and a little child (Coma or Gemini) shall lead them. And the cow and the bear (Ursa Major) shall feed; their young ones shall lie down together: and the lion (Leo) shall eat straw like the ox (Taurus). And the sucking child (Coma) shall play on the hole (Zodiac circle) of the asp (Hydra, Drago, Serpens), and the weaned child shall put his hand on the cockatrice' den. They shall not hurt nor destroy in all my holy mountain (Notice the moon-olive on Scorpio's stinger and the moon-bag over his head): for the earth shall be full of the knowledge of the LORD, as the waters cover the sea. And in that day there shall be a root of Jesse (Hydra), which shall stand for an ensign of the people; to it shall the Gentiles seek: and his rest shall be glorious." In Deuteronomy 4:2 and 12:32 God commanded Israel not to add to or diminish from the word he had spoken. Here in verse 19 is the same warning. Yet "Bulls" from the pope, the "Koran" by Mohammed, "the Book of Mormon," by Joseph Smith, "Science and Health" by Mary Baker Eddy and "Dianetics" by L. Ron Hubbard are just a few of the additions. We can agree with John who answered Jesus by saying "Even so, come, Lord Jesus."